We can offer you Aluminium TT Scrap (Taint Tabor) as per customer requirement. 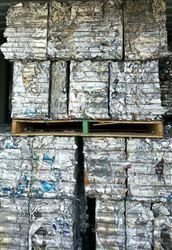 We already supply Aluminium TT Scrap (Taint Tabor) to Ahmedabad, Baroda, Surat, Rajkot, Jamnagar, Mumbai, Pune, Aurangabad, Delhi, Jaipur, Kolkata, Banglore, Chennai, Madurai, Cochin etc. 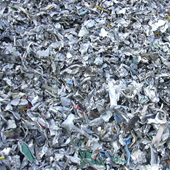 We are a trusted supplier of Taint Tabor - shredded material that consist clean old alloy Aluminum sheet of two or more alloys. We can provide Aluminum Taint Tabor in any desired quantity at competitive pricing along with timely delivery of product consignment. Clean mixed old alloy sheet aluminum Shall consist of clean old alloy aluminum sheet of two or more alloys, free of foil, Venetian blinds, castings, hair wire, screen wire, food or beverage containers, radiators shells, airplane sheet, bottle caps, plastic, dirt, and other non-metallic items.Oil and grease not to total more than 1%. Up to 10% Tale permitted. We offer excellet quality assortment of Aluminium taint scrap. With dedication and sincerity of our personnel, we have fixed a notable position for ourselves in this arena for offering an optimum quality of Aluminum Scrap Taint Tabor. Old Sheet Aluminum is also known as TAINT/TABOR as per ISRI. Must be free of UBC's and excessive iron. We are offering Aluminium Scrap Taint Tabor. It is offered as per the latest standard of the industry. It is credited for its excellent conductivity and high tensile strength. Our range is highly demanded. We offer our range at market leading prices. We are the manufacture of Aluminium Scrap TAINT TABOR As per ISRI. Under the supervision of our experienced professionals, we are providing high quality range of Taint Tabor Scrap. We are renowned importer and supplier of Aluminium Scrap Taint Tabor as per ISRI Grade. With our in-depth knowledge of this domain, we are actively engaged in offering an excellent quality assortment of Aluminium Taint Scrap.